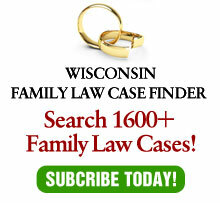 It is bad enough that the Wisconsin Supreme Court is wrong on the public policy regarding the modifiability of child support. Now, thanks to an April decision, the justices not only continue to be wrong about the public policy involved — they also have confused what should be simple law. On April 3, the state’s high court issued its opinion in May v. May, No. 10AP177, which affirmed the decision of Dane County Circuit Court Judge Maryann Sumi, on a certification from the Court of Appeals. The issue was a follow-up from Frisch v. Henrichs, 2007 WI 102, ¶75, in which the court held that a ceiling on child support was against public policy. While I disagree on the public policy, at least it was a simple rule that was easy to follow: Courts always have the authority to increase child support. In May, the state Supreme Court considered whether an agreement not to decrease child support for 33 months was valid and not against public policy. After substantial litigation, Michael and Susan May agreed that child support would not be reduced during that period of time, in exchange for which Suzanne agreed to pay 100 percent of the child-care costs. About a year and a half later, Michael sought relief from the stipulation, alleging that he had lost his job. The court found that he was equitably estopped from seeking a reduction in child support. Justice Patience Drake Roggensack penned the state Supreme Court’s majority opinion, holding that it is not against public policy to enter into a stipulation for an unmodifiable floor for child support as long as the duration does not exceed 33 months and that Michael was equitably estopped from seeking a reduction. That is a big enough exception to run a Mack truck through. Let’s deal first with the general public policy. While the court gives lip service to the freedom to contract, Frisch made it clear that this freedom was very limited. Instead of allowing knowledgeable adults to contract their own affairs, the court equates children’s best interests with money. As any children in this unfortunate circumstance would tell you, once their basic needs are met, their best interests are better served by preventing conflict between the parents than by requiring the maximum amount of child support possible. While that boat has sailed when it comes to a ceiling on child support, May offered the court an opportunity to at least be consistently wrong in one of two ways. The court could have held that all stipulations prohibiting modification of child support violate public policy. Or the court could have held that dollars are primary, so ceilings are out, but floors are allowed. Instead, the court did neither. The result is that the court is not only wrong on the public policy, but when it comes to floors, the law is confusing and contradictory. Abrahamson’s dissent was sharper. While she agreed that “freedom of contract cannot take precedence over the best interests of the child,” she characterized the majority’s reasoning as circular. As she put it, the majority decision means that, “a stipulation adopting an unmodifiable floor on child support is enforceable because it is judicially modifiable!” In fact, by the count of a colleague, she uses the term “incoherent” four separate times in referring to the majority opinion (If I didn’t know better, I’d suspect that not all of the justices like each other). While, as stated earlier, I disagree with the chief justice on the public-policy issue, she is right on about the problems with the majority decision. Either a stipulation can be modified or it cannot. Once a middle road is created, it destroys the purpose of such a stipulation. Undoubtedly, the majority believes the term “unforeseen circumstances” is both what preserves the concept of allowing such a stipulation while at the same time limiting the potential for litigation. The problem is that it will not accomplish the latter. Certainly, if the payor gets hit by a (Mack) truck, that would be an unforeseen circumstance. But that is not the common case. Rather, the usual unforeseen circumstance is the loss of a job. When is the loss of a job foreseen? Suppose a payor has had a job for many years, but suddenly is laid off? Or suppose the payor is self-employed and the economy takes a bad turn? The possible circumstances are limitless — and so is the potential for litigation. There is already protection for a payor who cannot make contractual payments. To find a payor in contempt, the court needs to find that the payor had the ability to make the payments. If the payor cannot make the payments, the court cannot find him or her in contempt. Rather, the court can order the payor to pay what he or she can to avoid contempt and defer the rest. The same principle can be applied to child support floors — and avoid a contradictory rule of law. It is not surprising in the least that the state Supreme Court continues to have a narrow view of the best interests of children. But it is surprising — and disappointing — that instead of being at least consistent, they have made matters confusing.